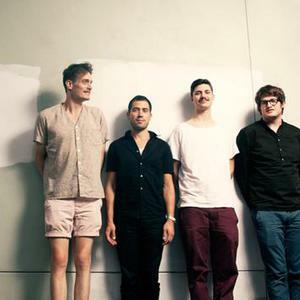 Efterklang is a band from Copenhagen, Denmark, consisting of four core members (Mads Brauer, Casper Clausen, Thomas Husmer & Rasmus Stolberg) who have played together since 2001. They are often joined by musicians like Peter Broderick, Frederik Teige, Heather Broderick and Niklas Antonson when they perform live and they also have a 5th member (Rune M?lgaard) who has been a part of Efterklang since the beginning, but who has taken a more secluded role in the past years. The Springer EP was originally released in a limited edition of 500 handmade covers in white fake fur. The Springer EP was originally released in a limited edition of 500 handmade covers in white fake fur. While printing the numbered Under Giant Trees EP Efterklang decided to store the first twenty copies as a collectors object. Unfortunately these were stolen. As a countermove 29 copies was stamped with a letter which were sold by auction at EBay and the profit was given to the environmental organization Nepenthes to protect the rain forest. Efterklang are signed to the British Leaf Label. Besides Efterklang, they also run the record label Rumraket. Efterklang signed with 4AD on the 2nd of September. This does not mean that they are cutting all ties to their previous home, The Leaf Label.